Torso and head now complete, couldn’t resist putting them together quickly to see how it’s all going to look! I still need to clean up some of the panel lining and sanding then we’re good to topcoat! I just want to mention sticker decals, I only tend to use select ones these days for eyes and random shiny bits but as of today this kits trashy stickers have inspired me to declare this a foil-sticker free zone! (except for maybe the gold trims on the Sinanju :S) Seriously avoid them unless you want a Gundam that looks cross eyed! 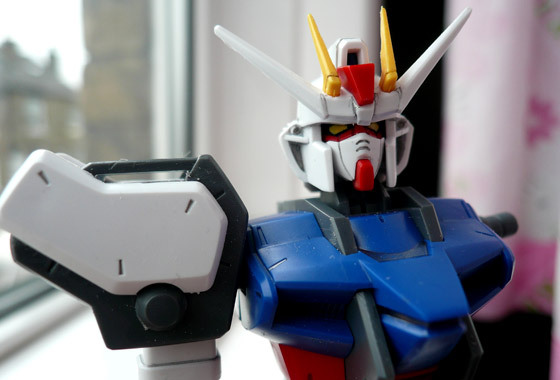 It’s Saltaire Festival this weekend so it’s doubtful i’ll get this bad boy done before Monday, but it won’t be long after that as the Gunpla bug has really caught me again! looks like you are a gumpla masta! please take me as you apprentice!! I only recently started to build gunpla but understand very little decals, panel lining and other advanced techniques and lingo. Please check my blog if you have the time to see my amateur creations. Hehe I wish but thanks for the compliment 🙂 i’ve been building gunpla for maybe 4 years but always really take my time so I haven’t actually completed all that many kits! I’d class my skills as probably a little above beginner and I’m still learning as I go along, and the little things like panel lining and topcoat spraying to add texture really go a long way! For the real masters check out Z’s blog or Plamo Addiction on my blogroll. You may recognise one of the new links on there – hope you don’t mind! Nice to see others working on this kit. I had finished mine back in 2007, but looking forward to see you progress further. Thanks G.G. 🙂 i’m finding little time to work on it at the moment as the Wedding invites obviously come first, it’s proving to be a fun build though! Your completed kit looks awesome! wish mine was an MG too as the proportions look better I think.